Performing necessary body work on your pickup truck can keep it looking great and can prevent deterioration due to rust and corrosion. Finding the right body parts for truck and SUV repairs and restorations can be challenging. In many cases, body accessories for trucks can provide a more aerodynamic profile or can enhance the appearance of your pickup to a considerable degree. Fender flares, trim, and other components can be installed to create a custom look for your truck or SUV and to enhance its overall visual appeal. Truck fender flares are designed to complement lift kits and high-profile tires and to shield your pickup truck’s finish against mud, road debris, and other substances that can cause corrosion or rust. Most fender trim options are intended specifically for a particular make and model of pickup truck or SUV and fit without the need for drilling into the fender; others are adjustable and may require additional work for proper installation. Covers and decal kits can allow you to enhance your truck’s appearance for an even greater degree of customization. Side skirts can reduce air drag and can create an attractive low-rider look for your pickup or SUV for added eye appeal. Custom hoods and hood scoops can increase the aerodynamics of your pickup and reduce its weight to allow greater acceleration and, in some cases, improved fuel economy and performance. Front bumper replacements can provide a sleek new look for the front end of your pickup and may enhance its aerodynamic profile for improved gas mileage. Rear bumpers can boost your pickup’s eye appeal and may provide added towing options and capability for light-duty projects. Rocker panels are an integral part of the support structure of your pickup truck; replacing these components with stronger materials can not only reduce rust and corrosion but can enhance the durability of your truck or SUV. These truck accessories can increase the working capability of your pickup on the worksite and may improve its performance on the open road. One of the best ways to upgrade your truck’s appearance on a budget, truck body moulding is most often available in clear, chrome, or black. Door edge guards, running board gap strips, and side moulding strips are among the most common types of pickup and SUV moulding. The right moulding solutions can also provide protection against minor dings, rust, and corrosion and may extend the useful life of your vehicle at work and on the road. Most moulding components feature self-stick adhesives, but some may require clips or other attachment methods. 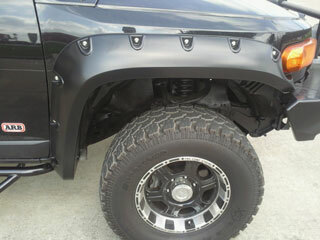 We offer a full line of truck components and Houston truck accessories to help you customize your pickup or SUV. Our outstanding selection allows you to find precisely what you are looking for at a price that suits your budget. We are your one-stop source for all your Houston truck bedliners, bars and racks, lift kits, and much more.